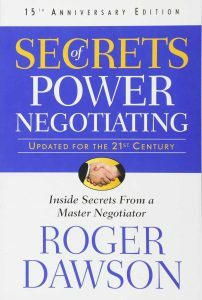 Secrets of Power Negotiating by Roger Dawson is a book on negotiating techniques (gambits, as he calls them) and mindsets. Negotiating is a super quick way of making (or saving) money. If you are negotiating a house, but even a car… Or a piece of furniture, you can make the equivalent of thousands of dollars in a hour. And it’s all bottom dollars: no taxes and expenses. But if you are asking for way more than plausible imply some flexibility or you might look out of touch from reality. Always react with some shock at their first offer. Most of the times, a concession will follow right away. When you don’t flinch and take the first offer seriously, then the seller (or buyer) will feel legitimized by their first offer and will try to defend it. When you escalate an issue you push the other party to want to prove you wrong. If you look eager, you show a weak hand and the other party will feel like they can do better. Show yourself reluctant instead, like you’re not sure, like they need to push you and cajole a bit more. Then don’t say anything and let them change their own stance with a concession. Weak negotiators fall prey of their own ego and present themselves as the ones with final authority. Much better instead if you can refer to a vague, higher authority that must approve. The author for example would negotiate the best price he could get. Then he would say it looks good but he only needs to run it to through the board. After a few days he’d get back in touch and say the board is being difficult and needs some better terms. The author used to take pride of being the owner of the flats he was renting. Then he realized that people always bothered him with too many question or asked for exception and thought he didn’t money on time because he must have been rich. Then he started introducing himself as the middleman for some foreign investors instead. I understand, sometimes it can get difficult, but on this property my hands are tied. They told me that if the rent is not due on time I must file an eviction notice. What can we do to get the rent on time? Imagine you’re a buyer and would like to spend 20k on a product. The quote comes in at 25k though. Wow that’s much more than I was expecting. I’d need to wait for the committee on that. I’d be comfortable giving you the go ahead for 20k, but anything above I’d need to hold off until the committee convenes. And there you just created enough pressure that the seller might want to make the sale right away and give it at your price. Ideally, you want to remove the recourse to higher authority right away. And you do that by having the other party admit that he can make a decision. “If the offer (or car/proposal) meets all your needs, is there any reason you wouldn’t give me a decision today? The value of a service or of a nice act quickly depreciates and becomes the status quo. If you do a favor, that means you won’t be able to get a favor back if you let too much time pass. That’s why you would must get concessions for your own concessions. If we can do that for you, what can you do for us? When people offer to “meet in the middle” play dumb. Oh, you mean like you could go down (or up) at X? Let me talk to my partners and see what they think. And then you have just moved the negotiation range with the previous middle now being the low-bound. When you’re facing an impasse, put the big issue aside and deal with the other small ones. That will allow you to rebuild momentum. One negotiator will pretend they are angry at your proposal and might storm out. The other one will say they will try to appease them… If you can make a few concessions here and there. This is the most obvious example (and BTW: you should avoid negotiating with two people when you’re alone in general). It can be used in conjunction with higher authority, where the negotiator says that the committee doesn’t usually like X but he’ll try to soften them. At the end of the negotiation, when the tension is releasing, try to have another go at something you couldn’t get earlier. Or add something new. Do with a smile on your face so it’s not confrontational and they know you’re not taking them seriously. Don’t make a final big concession and then say “that’s the most I can do”. If the concession is too big the other party feels like you still have room to go. Decrease your concessions instead until you say “now that’s it”. Some people say they don’t like wasting time negotiating and give their final price in their opening sentence. But these people, say the author, are doing it all wrong. Some other times you can get tricked in giving your bottom line. For example a customer might show up and say “we have 2 other similar products we want to go for. But just to take a quick look, can you give us your absolute bottom line price”. If you are dealing with a very interested party you can pretend your committee rejected rejected your last negotiation round and is also vetoing the previous one. Now the bottom line price you can do is X (X being higher than what you had told him before you were comfortable with). This is a big gambit that can make or break a deal. You don’t want to lose a negotiation just because of the other party’s ego. Watch out not to push too much and to give something. Cherry picking is shopping around for options, then going go your favorite provider and try to make him match his competitors on their favorable terms. You should try to stop your prospects from shopping around by showing your great knowledge in the field. Once they realize you can tell them what your competitors will proposes, they might realize there’s no point in wasting time. 80% of the concessions happen in the last 20% of the allotted time. Some unethical negotiator can use time against you, and that’s why you should never reveal if you have a deadline. When time pressure works on both sides, the side with the most options has most power. Some times you can leave your proposal on their table and with time they might find acceptable what at first they said they would never consider. Learn to develop walk away power. The author says that the minute you pass the point when you are able to say “I’m prepared to walk away from this”, you lost the negotiation. But don’t threaten to walk away abruptly, make it under the protection of good guy/bad guy. It’s annoying and cantankerous. Use instead something like “sorry but less than this I will have to drop out”. The hot potato is people trying to make their problem your problem. Like “it’s not in my budget” or “I can’t authorize that”. Power negotiator always test the validity of such expressions. Let’s imagine this hypothetical scenario where I can find you exactly what you’re looking for and you will love it and your team will love, is there any point in letting you know then? Imagine I could show you a car that is twice as safe and in the best running condition you’ve ever seen but cost 10% more. You might still want to take a look at it, don’t you? Justifiers are words that tell you in advance your partner is not going to deliver. They are expressions such as “I’ll try my best” or “I’ll see what I can do”. … They most often don’t mean a thing. Never Think You’ve Got the Weak Hand..
… That’s the mistake most beginners do. The book is great, but not all examples are in my opinion. One is the complaint to the top hotel staff to get a discount on the room. In one of the example Roger just does a nice sales of his CD during a dinner. Galvanized, he pays for both. When the guest say they would have paid the dinner, he calls back the waiter to get his credit card back (and he had also picked the best restaurant expecting the guests to pay). I couldn’t help but think that was the cheapest move ever (and the second cheapest move is to pick the most expensive restaurant knowing your guests will pay, I always despised that behavior). I found the chapters on local customs to be little more than folklore with some utter nonsense mixed in. He says that part of the reason why Germans enjoy 3 weeks in a SPA and Americans only work is that America never experienced the life-changing effect of a war. Little later he says “Asian people are very relationship-based”. Asian people… ?? Frankly, I doubted that they would ever make a transition to a free market economy because the Russians are not entrepreneurial at heart. Understand that the communist system removed all incentives from their way of life. Again I’m scratching my head. There are a few chapters on body language, but some of it is wrong. He says that after all the countries he traveled, smile was the only body language to mean the same in all languages. Not true, there are many more signs that are cross-cultural. If you can find a balcony in Ravello and get yourself a glass of Chianti Classico while you savor the view that has enchanted visitors for centuries, you’ll agree with me that life doesn’t get much better than that. You can search if you want, but you might as well take my word for it: Life doesn’t get much better than that. Maybe it does with a bottle of Chianti Classico. The author talks about the power of charisma and uses Clinton as an example. I feel he makes a major confusion here between charisma and charm (if you’re interested read how to be charming and how to be charismatic). The wisdom of Power Negotiating is exactly the kind of wisdom that I want to promote here on this website. This is the kind of knowledge and information that will make the victims into this world be able to stand up for themselves against the sharks of this world. The author goes into the training that hostage negotiator do and how hostage negotiation works. Fascinating stuff. I have listed a lot of cons. But if you have been reading around here I always list a lot of cons for the best books. It’s because I hold them at a whole different standard than most books. And Power Negotiation is that kind of book that you have to hold to a higher standard simply because it’s that book. The first part is better than the second half that gets a bit too chatty and long-winded. But overall, this is a life changing book. And a book everyone who wants to understand psychology and human nature should read. This is exactly the kind of information that this website wants to spread to empower people.